The legendary Chicken Marbella recipe from The Silver Palate. The Silver Palate Cookbook and I were both born in 1979. So it’s not surprising that this is the cookbook I most associate with my childhood. It was often out in the kitchen, especially when my parents, budding gourmets (and sometimes gourmands) were having a dinner party. Co-authors Julee Russo and Sheila Lukins taught them how to make crème fraîche, Hollandaise sauce and pesto. We all especially loved the book’s vegetable purées: the creamy, nutmeg-kissed broccoli one and the tart beet and apple purée I made as a girl for my parent’s wedding anniversary dinner. And I know folks still swear by The Silver Palate‘s carrot cake and banana cake recipes. But I’d never tried the cookbook’s signature chicken Marbella. When Sheila Lukins died in 2009 at the age of 66, this was her legacy recipe we kept hearing about; how it defined dinner parties of the growing yuppie class in the 1980s. I finally had a chance to try the dish tonight, when my mother-in-law made it, with a spirit of nostalgia. 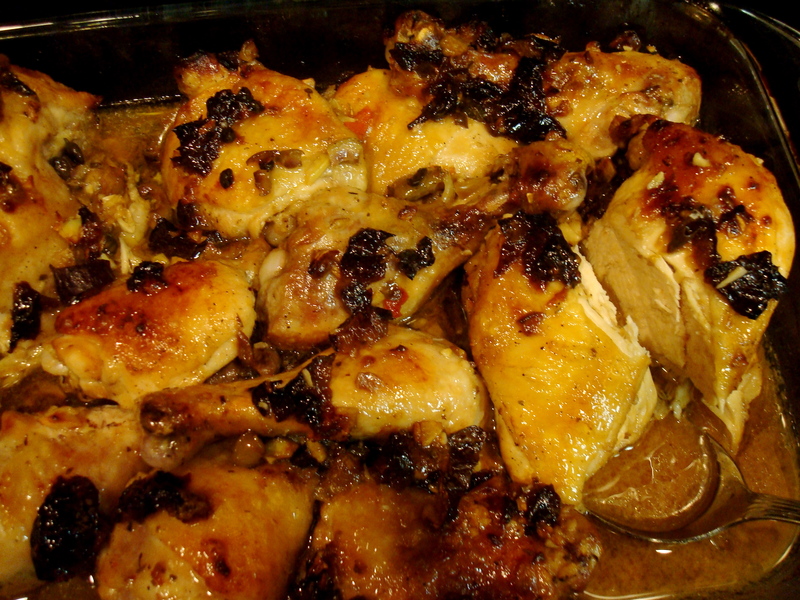 The marinade/sauce has that addictive salty-sweet-tart flavor of prunes, olives, capers, vinegar and brown sugar. I do remember once having some cold balsamic chicken breast salad with dried apricots and olives that invoked the flavor’s of this dish. But balsamic vinegar is a noticeable omission in the original Silver Palate. Red wine and white wine vinegar, even sherry vinegar, yes, but balsamic had yet to appear on the scene. Just selected some Crudites and finger food recipes from this very cookbook for our 90th birthday celebration on Jan 2 for my Paw. And funnily enough, I bought this cookbook used (Book Bin) and the note in the fron from the person gifting it to whoever says to try the Chicken Marbella on pg. 86. Your description makes me want to make it ASAP! Thanks! I’ve got a tattered old copy of The Silver Palate I’ve had for years. Along with their “New Basics Cookbook,” it really defined an era and has a bunch of recipes that still taste damned good. Glad you’re back Laura! I still use the recipes from both Silver Palate and the New Basics cookbook on a regular basis. Oatmeal raising cookies and chili for a crowd are favorites!